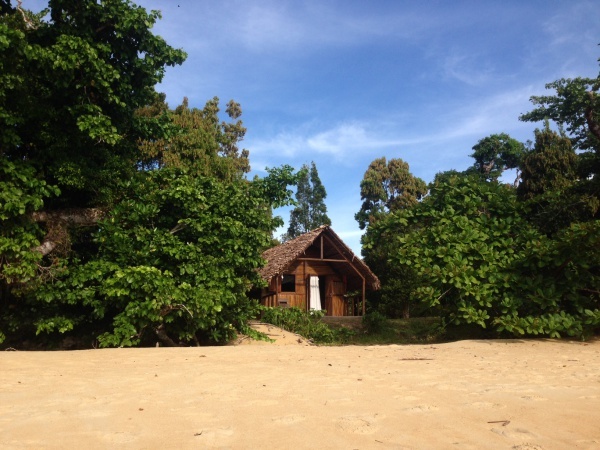 Tampolodge is an eco-lodge located in Antongil Bay on the Masoala peninsula in the northeast of Madagascar. The property lies within the Masoala National Park and is surrounded by one of the last remaining primary forests on earth. The name Tampolodge derives from the nearby village of Tampolo, a wonderful place where the forest meets the sea. The lodge can be reached only by boat or on foot, starting from the town of Maroantsetra. 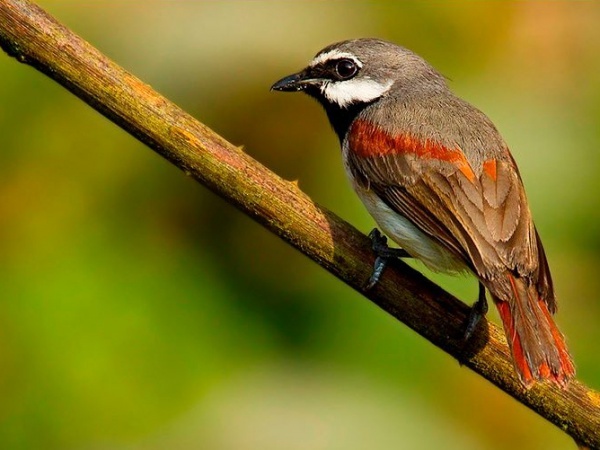 Tampolodge was founded by Giuseppe, an Italian biologist and former researcher specialised in ornithology. Having worked on projects in Italy, Kenya and Tanzania for the University of Milan, he thereafter worked on several projects for the Peregrine Fund in Madagascar. Guiseppe soon became captivated by the beauty of Masoala where he set up a camp. 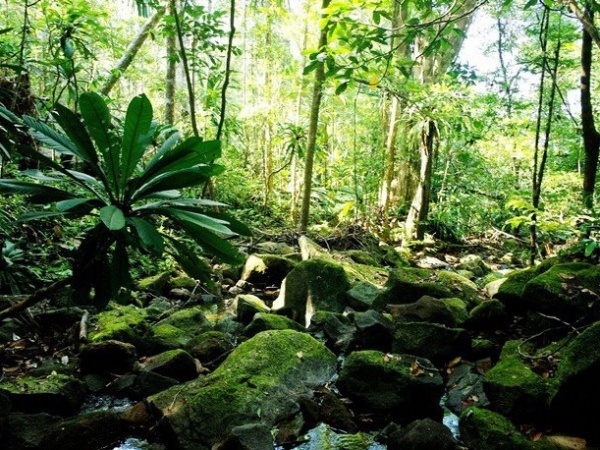 In 2001, the site also served as the basecamp for the French botanist and biologist Francis Hallé while exploring the treetops of the rainforest during his expedition known as Radeau des Cimes (navigating the treetops with an aerostatic balloon). The lodge has eleven bungalows, divided into four family bungalows and seven twin bungalows, and a restaurant. All bungalows are built in style of Malagasy huts using local materials that blend harmonically into the nature. The lodge faces the usually calm waters of Antongil Bay and is surrounded by a garden of cinnamon trees, clove shrubs, vanilla orchids and majestic mango and lychee trees. Additionally, a house with two bedrooms and a large veranda is available to guests on a self-catering basis of minimum four nights. The building is a short walk from the beach. A stay at Tampolodge includes full board, consisting of a continental breakfast, lunch and dinner. 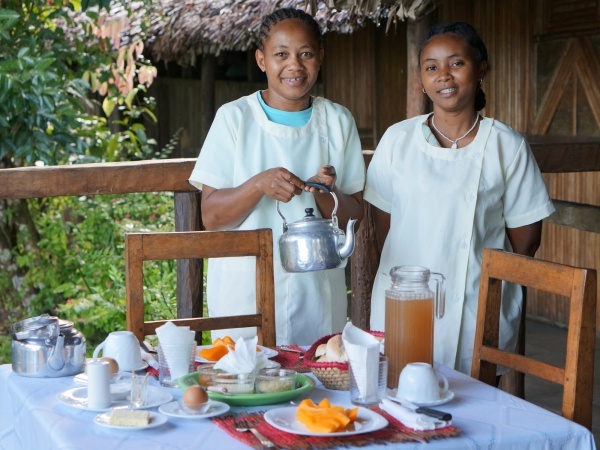 The kitchen serves traditional Malagasy food, adapted to Western taste. Soft drinks and alcohol are charged extra. 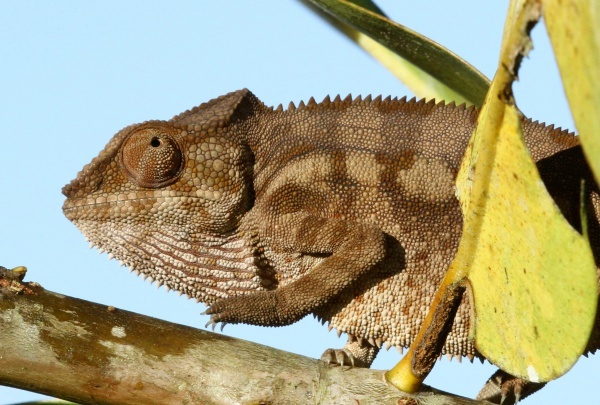 The Masoala National Park encloses more than 250,000ha primary forest and is home to countless animal species and plants, amongst them the strangest and the rarest; 75% of Madagascar's plant and animal species are unique to the country. Small and large rivers flow from the heart of Masoala in the direction of the ocean. Tampolodge is a world apart where nature lovers can admire the incredible biodiversity found in the forest and sea. Visitors will not only hear whales sing to the cries of Red ruffed lemurs, but also the melody of waves hitting the sandy beaches and the most incredible frog concerts. Botanists will love the impressive variety of plants, or to say it in the words of Giuseppe: "The Nature offers you its green carpet.". Amongst the many palm species is the beautiful and majestic Satranala, a palm that only exists here. Some species of palms are even being discovered today. In the primary forest many animals can be seen. Tampolo is known to be the perfect place to observe the Red ruffed lemur (Varecia rubra), which can be found only on the Masoala peninsula. 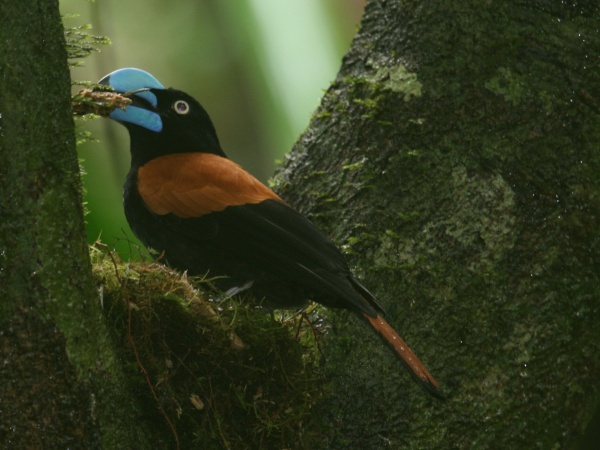 With a bit of luck, one might also see the Helmet vanga (Euryceros prevostii), a bird that can be easily recognised by its large electric blue beak, or the nocturnal Aye-aye (Daubentonia madagascariensis), which is no doubt the strangest mammal on Madagascar. Amongst the reptiles are numerous geckos and chameleons, including the tiny Brookesia perrieri that fits in the palm of a hand. Also the marine park offers a rich biodiversity, including different species of turtles, clams, shellfish and countless colourful reef fish as well as dolphins frolicking in the bay. The highlight is definitely the ritual passage of the whales from July to October, when they come to the warmer waters of Antongil Bay to give birth. It is amazing to watch a ballet of these giants of the sea, when they completely jump out of the water, play and stroll in the currents to the sound of powerful winds. Giuseppe's team can organise a variety of activities combining walking, climbing, fishing, canoeing and relaxing. All the tours are flexible. On request a boat as well as a team comprising of a guide (obligatory), cook and porters can be arranged. Tampolodge is an ideal starting point for excursions into the primary forest. Many trails pass through the Masoala National Park. Experienced park guides will lead you and help you to discover the extraordinary nature. Hiking enthusiasts are recommended to take a boat ride to Ambanizana. The return to Tampolo is a fascinating walk (4-6 hours) on pristine beaches and along forest trails. The real adventurers can walk from Maroantsetra to Tampolo. This trek takes three days. Canoeing up the river for about an hour will fully immerse you in the forest. For those who love deep-sea fishing Tampolodge provides professional equipment. Antongil Bay is a hotspot for yellowfin tuna, but also kingfish, barracuda, jacks and billfish can be caught. A visit to Nosy Mangabe provides an opportunity to observe the Aye-aye. 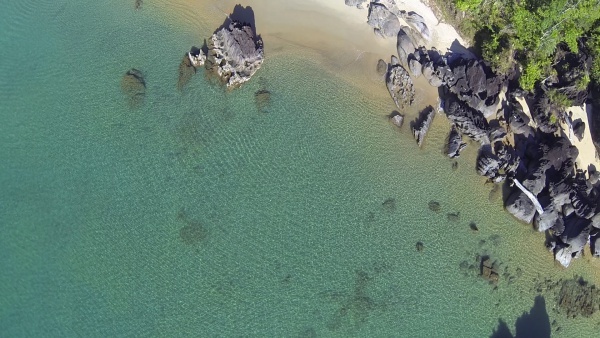 Nosy Mangabe is an island full of history, with tombs and ancient writings engraved on rocks by pirates. It is possible to stay a few hours or even a few days on the island. For overnight camping, guests need to bring their own tent. Everything else, including a matress for camping, a sleeping bag, food and guide can be organised by Tampolodge. In the opposite direction, a combined boat and trekking adventure to Cap Masoala can be arranged. The boat ride to Cap Masoala takes about two hours and the trek back along the coast, beaches and through villages takes two to three days. The villages along the route are Fampotabe, Namantoana, Ratranavona, Antalavia, Marofototra. While a guide and food will be provided, guests need to bring their own tents. Alternatively, basic accommodation can be arranged in the villages. Air Madagascar operates domestic flights from Antananarivo to Maroantsetra. One of the Tampolodge staff members will welcome you at the airport and transfer you to the port. From there it is an about 2-hour boat ride to the beach of Tampolodge. This page was last modified on 20 April 2019, at 08:27.